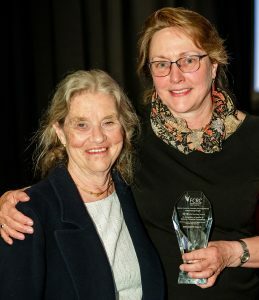 When the peak body for financial counselling in Victoria – the Financial and Consumer Rights Council (FCRC) – celebrated its 40thyear in financial counselling and consumer advocacy recently, Bernadette Pasco, Executive Officer for ICAN Learn, didn’t know she was about to become part of the celebration. At their gala dinner, the FCRC presented Bernadette with their prestigious ‘Life Membership Award’, in recognition of her tireless commitment and dedication to the professionalisation of the financial counselling sector. “I was absolutely shocked to receive the Life Membership Award” said Bernadette. “There are only 3 other life members of FCRC, so I’m number 4! Having been a passionate member of the FCRC for 15 years, becoming a life member is a huge honour. This award really connects my current work of sector development, to those who worked so hard to establish it in the early years.” she said. With over 40 years’ experience working in community services, health, and financial counselling, Bernadette has witnessed the growth of the financial services sector first hand. As Bernadette explains “since coming into the financial sector 15 years ago there have been significant changes, such as the introduction of national standards and the integrity of training and development. This is especially evident in the structured delivery of the Diploma of Financial Counselling, the development of professional supervision to mitigate vicarious trauma and improve casework, and identifying the financial capability role as separate from that of financial counsellor”. The development and recognition of specialist roles is another major shift withn the sector. Funding has also driven change in many ways. 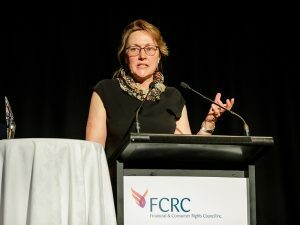 “The National Debt Helpline (1800 007 007) has been instrumental in being able to link people easily to a free financial counsellor – the ‘James Bond number’ is one that all students and clients alike remember!” she said. Bernadette believes that as financial counselling starts to move into a prevention framework through specialist roles, the journey for vulnerable consumers will improve on a daily basis. One of the ways we can do this is through education, and what better way to start than with the social enterprise RTO ICAN Learn! Our advanced diploma will provide the first step into higher education and recognition of skills to drive better wages, conditions, and to make the sector sustainable. And ICAN couldn’t agree more. Congratulations Bernadette!